Many politicians in Haiti talk about the love of their country as the reason they want burn it down or force a sitting president to resign and leave the country (rache manyok ou bay teren an blanch) but as soon as they get to choose themselves of one of their cohorts to join the government, the love is gone and greed steps in. 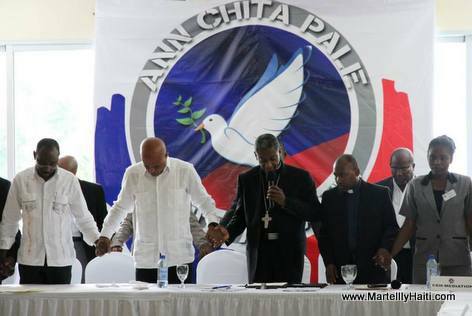 Some Haitian journalist have been talking about the famous El Rancho accord, the dialogue President Martelly had with the opposition against him. What exactly did the country get out of it? What will the Republic of Haiti get out any political dialogue when it is clear that people who lost an election establish themselves as opposition to bug the crap out of the winning party? Not one person ever did something for the country. Every single man that ran for office has walk away with money and no conscious.